I had knit this for my daughter approximately 19 years ago, when she was 12 years old. She might have worn it once. She hates yellow. Why did I knit her a yellow sweater? I like yellow, and thought she looked good in it, but so what? My opinion wouldn't make her wear it. She recently observed that she doesn't look good in light colors. I do. 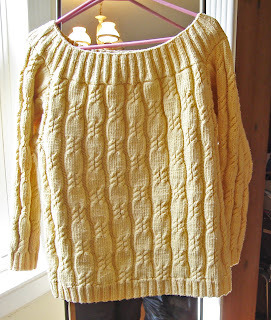 Was I really knitting myself a yellow sweater for the future? The style, from the Spring/Summer edition of Vogue Knitting, was meant to be oversized. I must have made this for her in size small, or possibly medium. It fits me well now, given the more fitted styles of today. The sleeves are too short, but that's ok - they are 3/4 or bracelet length. Perfect. This sweater marks the last time I tried to make clothing for my daughter with the exception of her eighth grade graduation dress. When you're a teenager or a grown woman it just gets too complicated given body type and body image. It's hit or miss. That's why I make accessories for other adults, but am reluctant to make clothing. For myself, I can take a chance. I really liked this pattern. I made one for myself, properly oversized, in white. That sweater I have lost track of. I also made myself another sweater form that issue, one that I still have. It was designed by Annie Modesitt. 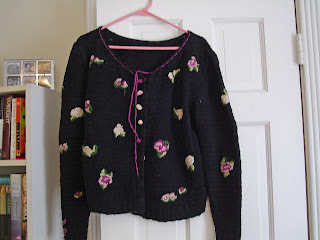 It's a pretty cotton cardigan covered with embroidered roses and crocheted buttons. But I think I improvised the buttons because I didn't know how to crochet then. The buttonholes are machine made and backed by grosgrain ribbon, a work of art. The spaces between the button don't gape as they do in hand-embroidered, unfaced button bands. It's nice to be able to keep and use old things. I'm glad I have these sweaters, but both have problems. For one, the neckline on both is too wide. For the yellow sweater, I'll just have to let the straps show, maybe wear a cami. I certainly can't go braless, though I did with the white one twenty years ago (it was loose). I tried to correct the neckline on the cardi by gathering it with a knitted cord when I made it. It's magenta; you can see it hanging down in the photo. The more serious problem, as it so often is, is yarn selection. 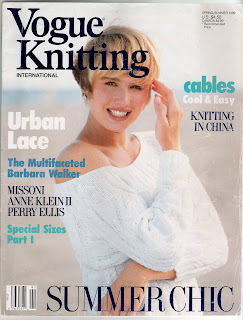 I guess I didn't know the difference between worsted and dk in those days. Both sweaters are knit in Reynolds Saucy, a 100% cotton worsted weight yarn. I must have gotten gauge, but the sweaters, both meant to be knit in dk, are too heavy and bulky. Since then, I have learned to avoid 100% cotton yarns anyway; blends are lighter weight and more elastic. My braless days are long gone for me too!